• Regal L.A. Live Stadium 14, 1000 W. Olympic Blvd., Los Angeles; (844) 462-7342; https://www.lalive.com/movies Oct. 20-25 at12:15, 3:30, 6:45 and 10 p.m.
• Harkins Cerritos 16, 600 Los Cerritos Center, Cerritos; (951) 686-3456; www.harkinstheatres.com Oct. 20-26 at 10:30 a.m., 1:30, 4:30, 7:30 and 10:30 p.m.
• The Frida Cinema, 305 E. 4th St., Santa Ana; (714) 285-9422; https://thefridacinema.org/ Oct. 20 at 7:30 and 10 p.m.; Oct. 22 at 8 p.m.
• Starlight Dos Lagos 15, 2710 Lakeshore Dr., Corona; (951) 603-0967; http://starlightcinemas.com Oct. 20-26 at 7:30 p.m. Directed by Naoko Yamada (“K-On!”) and known in Japan as “Koe no Katachi,” the film is based on the manga of the same name by Yoshitoki Ōima. 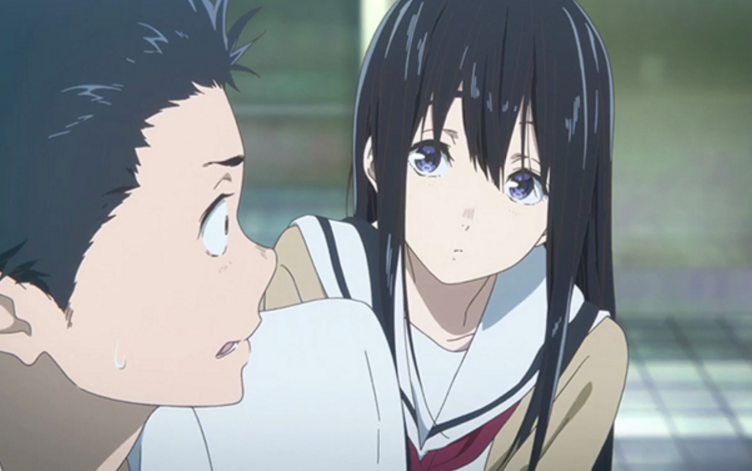 The story centers on Shoya Ishida, who starts bullying the new girl in class, Shoko Nishimiya, because she is deaf. But as the teasing continues, the rest of the class starts to turn on Shoya for his lack of compassion. When they leave elementary school, Shoko and Shoya do not speak to each other again —until an older, wiser Shoya, tormented by his past behavior, decides he must see Shoko once more. He wants to atone for his sins, but is it already too late? The voice cast includes Miyu Irino, Saori Hayami, Aoi Yûki and Kenshô Ono. Makoto Shinkai, director of “Your Name,” called the film a “fantastic piece of work” and a “polished and grand production” that even he is unable to replicate. It won Best Animation of the Year at the 26th Japan Movie Critics Awards, and was selected as one of nine feature films in competition at the 2017 Annecy International Animated Film Festival. Alhambra: Renaissance Stadium 14 + IMAX, Nov. 7 to 8 at 7 p.m.
Bakersfield: Reading Cinemas Valley Plaza 16, Oct. 21 at 11 a.m., Oct 23 at 7 p.m.
Carson: Cinemark Carson & XD, Oct. 23 at 7 p.m.
Chico: Cinemark Chico 14 & XD, Oct. 20-26 at 10:30 a.m., 1:30, 4:30, 7:30 and 10:30 p.m.
Daly City: Century 20 Daly City + XD, Oct. 23 at 7 p.m.
Downey: Cinemark Downey & XD, Oct. 23 at 7 p.m.
Dublin: Hacienda Crossings Stadium 20 + IMAX, Nov. 7-8 at 7 p.m.
Elk Grove: Century Laguna 16 & XD, Oct. 23 at 7 p.m.
Fairfield: Fairfield Stadium 16 + IMAX Nov. 7-8 at 7 p.m.
Fresno: Fresno Stadium 21 + IMAX, Nov. 7-8 at 7 p.m.
Huntington Beach: Century Huntington Beach & XD, Oct. 23 at 7 p.m.
Irvine: Irvine Spectrum 21 + IMAX & RPX, Nov. 7-8 at 7 p.m.
La Quinta: Century La Quinta + XD (Century Theater NextGen), Oct. 23 at 7 p.m.
Larkspur: Lark Theater, Oct. 20 at 8:30 p.m., Oct. 22 at 5 p.m., Oct. 26 at 5:30 p.m.
Long Beach: Cinemark at The Pike Outlets & XD, Oct. 23 at 7 p.m.; The Art Theatre, Nov. 24 at 11 p.m., Nov. 25-26 at 11 a.m.
Los Angeles: Cinemark 18 & XD, Oct. 23 at 7 p.m.; Cinemark Playa Vista & XD, Oct. 23 at 7 p.m.
Mountain View: Mountain View Cinema 16 (Century Theater), Oct. 23 at 7 p.m.
North Hollywood: Cinemark North Hollywood, Oct. 23 at 7 p.m.
Orange: Century Stadium 25 & XD, Oct. 23 at 7 p.m.
Oxnard: Century RiverPark 16 + XD, Oct. 23 at 7 p.m.
Palm Springs: Signature Palm Springs 9, Nov. 7-8 at 7 p.m.
Rancho Mirage: Century @ The River & XD, Oct. 23 at 7 p.m.
Redwood City: Redwood Downtown 20 + XD, Oct. 23 at 7 p.m.
Sacramento: Century 16 Greenback Lane & XD, Oct. 23 at 7 p.m.; Tower Theater, Oct. 21 at 11 a.m., Oct. 23 at 7 p.m.
San Bruno: Century at Tanforan & XD, Oct. 23 at 7 p.m.
San Diego: Carmel Mountain, Oct. 21 at 11 a.m., Oct. 23 at 7 p.m.; Town Square 14, Oct. 21 at 11 a.m., Oct. 23 at 7 p.m.
San Francisco: Century San Francisco Centre 9 + XD, Oct. 23 at 7 p.m.; CineArts at the Empire, Oct. 23 at 7 p.m.; New People Cinema, Oct. 21 at 10:20 a.m., 1 and 3:30 p.m.
San Jose: Century 20 Oakridge & XD, Oct. 23 at 7 p.m.
San Rafael: Century Northgate, Oct. 23 at 7 p.m.
Santa Clarita: Valencia Stadium 12 + IMAX, Nov. 7-8 at 7 p.m.
Temecula: Temecula Stadium 15 + IMAX, Nov. 7-8 at 7 p.m.
Union City: Century 25 Union Landing & XD, Oct. 23 at 7 p.m.
Ventura: Century 10 Downtown, Oct. 23 at 7 p.m.